Canadian Community Utilization of Stroke Prevention: Emergency Department. Atrial fibrillation (AF) is the most common sustained arrhythmia affecting 1-2% of the population of the Western world, and its incidence is increasing due to aging of the population and better detection. 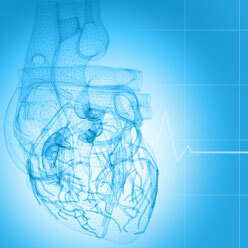 The Framingham Heart study showed that AF is associated with a doubling of mortality and a six-fold risk of stroke. Oral anticoagulation (OAC) reduces stroke risk by 60-80% in AF patients, but only 50% of indicated patients receive OAC. Many patients present to the emergency department (ED) with AF due to arrhythmia symptoms, which offers an important opportunity to prescribe OAC in those at increased stroke risk. However, around 50% of AF patients visiting the ED are discharged without OAC. This relates to many potential reasons, among which inadequate knowledge of management guidelines, hesitance of ED physicians to prescribe OAC with uncertain follow-up, and multiple competing medical problems and medications. Lack of OAC prescription in the ED has been identified as a significant gap in the care of AF patients. The C-CUSP ED Study is a multicenter practical three-phase implementation study which aims to determine if a multidisciplinary ED-based intervention, using provider and patient education, oral anticoagulation (OAC) sample toolkits in the ED and immediate follow-up by a community-based specialized AF clinic, can improve emergency physician prescription of new OAC for patients presenting to the ED with AF. 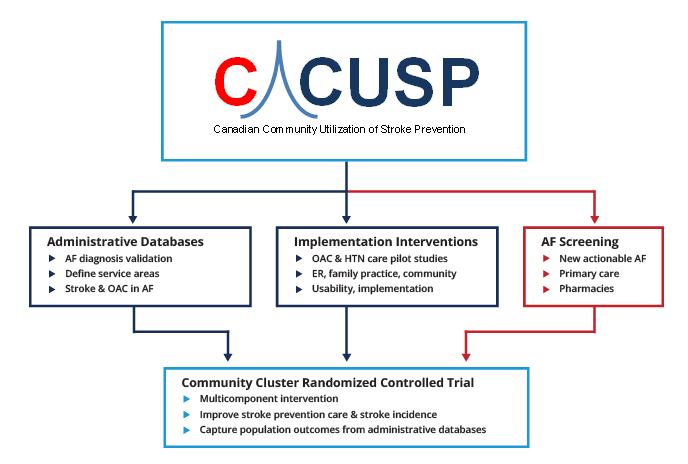 The Canadian Community Utilization of Stroke Prevention (C-CUSP) program will combine the results of administrative database analyses, intervention studies and screening studies to create a larger community cluster randomized controlled trial to evaluate multicomponent interventions to improve stroke prevention care and stroke incidence in patients with atrial fibrillation. If successful, this RCT could lead to sustainable strategies to reduce stroke in Canada without added healthcare costs. The assembled C-SPIN network will allow rapid spread and implementation of successful strategies across Canada.